On May 11, 1912, famous aeronaut, Professor Clarence C. Bonette, of St. Johnsbury, Vermont, was scheduled to give a performance at Lynn, Mass. Bonette’s plan was to rise to a predetermined height in his balloon, and then drop using a parachute. He began his ascension from the intersection of Spring and Washington Streets, and when he’d reached an altitude of 10,000 feet over the area of High Rock, he decided to make his drop. As soon as he began his descent it was apparent that the parachute wasn’t working right, and within seconds Bonette had lost control. He crash-landed on the roof of a home belonging to Fred Campbell on Bay View Avenue before sliding off and hitting the ground. The professor suffered several broken bones in the accident. For more information about Professor Bonette, see the article “C. C. Bonette – Early Vermont Aeronaut” under “ARTICLES” on this website. The Barre Daily Times, (Vt.) “Prof. C. C. Bonette Hurt In 10,000 Foot Drop”, May 13, 1912, Page 2. Prof. Bonette began his aeronautical career in the 1890s by giving parachute/balloon exhibitions at fairs and expositions around New England. His performances involved going aloft in his hot air balloon and then dropping from a pre-determined altitude using a parachute. In later years he devised a spring-loaded “cannon” which hung from beneath the balloon. When the balloon had risen to the proper altitude, Bonette would appear to be fired from the cannon before parachuting safely to the ground. The stunt was actually an illusion created by fire works and confetti to make it appear that the cannon had fired, but in reality no gun powder was used. According to an interview given by Bonette to Alton H. Blackington in 1943, the professor made his first parachute drop at a fair in Plymouth, New Hampshire, in 1893, after the featured aerialist took sick minutes before the scheduled performance, and Bonnete volunteered to act as a replacement. Being an aeronaut was not without its hazards, and it would seem that Professor Bonette had more than his share of close calls. The following are a few examples. While performing at the South Ryegate (Vermont) Fair during the third week of September, 1895, Bonette experienced a problem with his parachute line becoming entangled with one holding a sand bag used for ballast while he floated high in the air. He decided to cut the parachute loose thinking it would pull the tangled line free, but it didn’t. The Vermont Phoenix newspaper had this to say about the incident: “C. C. Bonette, the aeronaut, came very close near making his last ascension at St. Johnsbury recently, when 5,000 feet in the air, he found that the balloon and parachute had by some means become connected by a string, but by great effort he succeeded in freeing himself just in time to save his life.” Fortunately Bonette was not injured. Two months later, on November 14, 1895, it was reported in the News And Citizen (a Morrisville, VT. newspaper) that Professor Bonette had just completed a successful season as an aeronaut having made 28 balloon ascensions since July 1, with only one accident. That accident occurred while he was performing in Pittsfield, Maine, when his balloon began to collapse while he was 300 feet in the air. Thinking quick, he dropped with his parachute, which opened in the nick of time to save his life, although he still made a “hard landing” and received injuries which took a week to recover from. In June of 1899 Bonette’s balloon developed a leak while 200 feet in the air while he was performing at Ridgewood Park in Brooklyn, N.Y. Bonette dropped using a parachute which didn’t sufficiently open in time. He crashed into the top of an apple tree and suffered severe bruising, but no broken bones. The following September, while performing at the Rochester Fair in Rochester, New Hampshire, Bonette suffered another accident. While preparing to take off in a balloon from which he intended to make a parachute drop, he told his assistants, “Goodbye boys, I’ll see you later, but how much later I don’t know.” When the balloon was released, it rose quickly, but suddenly developed a small tear which allowed the hot air to begin escaping. The professor cut loose with his parachute, but it didn’t fully inflate until he was almost to the ground. He struck the earth hard, and his head and shoulders came in contact with a post sticking up two feet from the ground. While performing at St. Albans, Vermont, during the last week of August, 1901, Bonette’s balloon rose to an altitude of 3,000 feet and then hung suspended over Lake Champlain, forcing him to make his scheduled parachute drop while still over the water. He splashed down about a quarter mile from shore and was quickly rescued by nearby boaters who’d anticipated the outcome. In August of 1902 the Bare Evening Telegram reported that Professor Bonette, “had several narrow escapes lately, the last one Saturday when he was blown 3 miles out on Long Island Sound and came near drowning before boats could reach him.” He’d been performing at Southport, Connecticut, at the time. On October 10, 1907, Bonette’s balloon burst open while he was 200 feet in the air while performing at Claremont, New Hampshire. He jumped with his parachute while still 100 feet above the crowd, but it didn’t fully open and he was seriously injured. He was taken unconscious to Claremont Hospital, but later recovered to resume his career. The following year on October 1, 1908, Bonette was in Brattleboro, Vermont, preparing to give a performance when his clothing suddenly caught fire as he was inflating the balloon. Bonette knew to stop-drop-and-roll, while bystanders threw blankets over him thus smothering the flames. Although badly burned around his face, neck, shoulders, back, and legs, the professor didn’t want to disappoint the crowd, and did his scheduled parachute drop anyway. Upon landing he was taken to Memorial Hospital for treatment. On May 11, 1912, Bonette was seriously injured at Lynn, Massachusetts, when his parachute failed to open properly as he dropped from 10,000 feet. He slammed down on the roof of a home on Bay View Avenue and then slid off and hit the ground. The impact broke several bones. Professor Bonette is credited for building the first “aeroplane” to be constructed in the State of Vermont. It was a Curtis-type biplane 24 feet in length, equipped with a 40-60 hp. engine specially built for the aircraft. He began building it during the winter of 1909-10, and being the first airplane constructed in the state, he named it “Vermont No. 1”. The entire aircraft, including the weight of the Professor, was reported to be a mere 600 pounds. 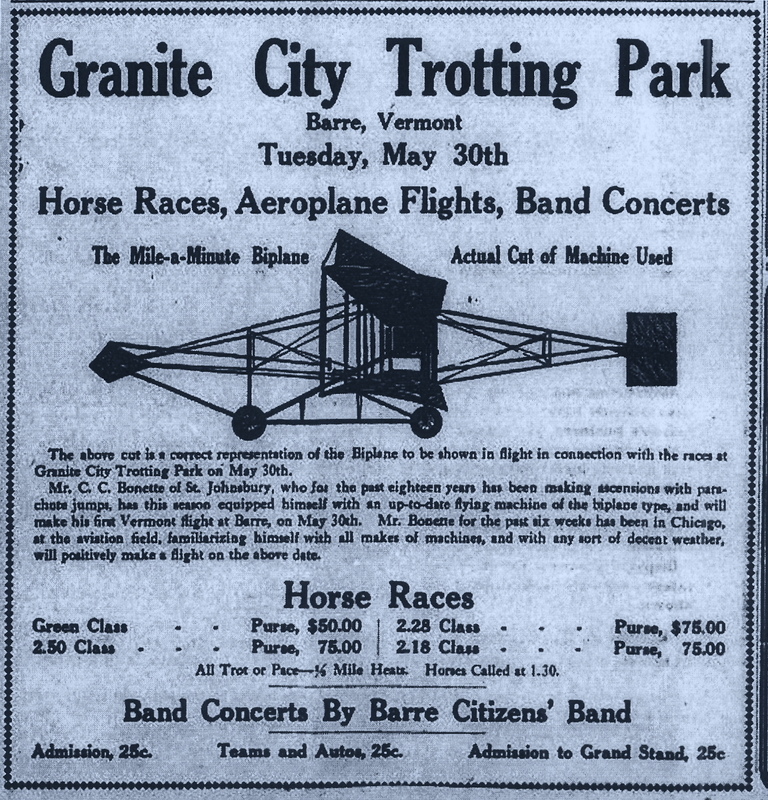 1911 advertisement for the Granite City Trotting Park where Professor Bonette was to make his first flight in Vermont with his new “aeroplane”. In July of 1910 Bonette announced his aircraft was nearly complete and he planned to fly it soon. Unfortunately, although the professor may have been the first to construct an aircraft in Vermont, he wasn’t credited for being the first to fly one. That honor went to John Willard who flew at the Caledonia Co. Fair in St. Johnsbury, Vermont, on September 15, 1910. A brief but interesting news item from the St. Johnsbury Caledonian dated October 19, 1910, stated, “Prof. Bonette made a flight Friday with his aeroplane and when nearly ready to alight one of the guy wires broke, letting him down and breaking the machine badly.” Unfortunately, no further details pertaining to the date or location of the mishap were given, but the incident may have occurred at the St. Johnsbury fair grounds, for again, according to another article in the St. Johnsbury Caledonian on November 2, Bonette again tried to take off in his airplane before the Gentleman’s Driving Club in St. Johnsbury, but the engine wouldn’t start. He speculated that it was because it may have been damaged internally in the hard landing, and thought he may have to send it back to the factory for repair. Unfortunately the flight didn’t take place. On June 1, 1911, the Burlington Weekly Free Press reported that the flight was cancelled due to rough ground at the starting point which caused one of the plane’s running wheels to break. Professor Bonette was married to Minnie Wilson Bonette, who was seriously injured in a fall from a balloon at Malone, New York, on September 27, 1897. Although confined to a wheelchair, she still accompanied her husband to his performances until she passed away in 1922. The professor lived until 1947, and is buried next to his wife in the Sutton Village Cemetery, in Sutton, Vermont. To see a photograph of Professor Bonette, see www.findagrave.com, Memorial # 130371752. St. Johnsbury Caladonian, “Fast Time At The Races – The Balloon Ascensions”, October 19, 1893. Vermont Phoenix, no headline October 4, 1895, page 8. News And Citizen, (Morrisville, VT.), no headline, November 14, 1895, Page 4. New York Daily Tribune, “She Jumped Too Soon”, October 1, 1897, page 7. The United Opinion, (Bradford, VT.) “News Items” June 23, 1899, Page 4. 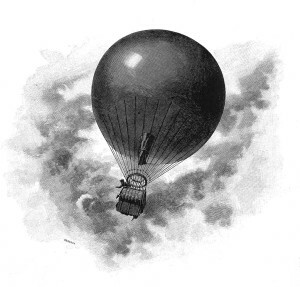 St. Johnsbury Caledonian, “Aeronaut Bonette Gets Wet”, September 4, 1901, page 4. News And Citizen, no headline, July 30, 1902, Page 3. St. Johnsbury Caledonian, Caladonia Co. Fair advertisement, September 9, 1903, page 3. St. Johnsbury Caladonian, “The County Fair”, September 16, 1903, page 4. Herald And News, (West Randolph, VT.) “Two Vermont Airships”, July 7, 1910, page 3. Orleans County Monitor, (Barton, VT.) “Vermont’s First Aeroplane”, September 7, 1910, Page 7. 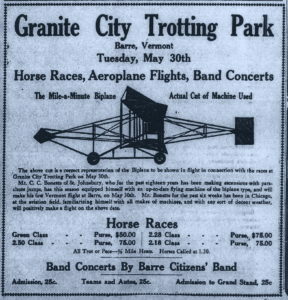 Barre Daily Times, Crantie City Trotting Park advertisement, May 25, 1911, page 4. Interview With Clarence Bonnette In 1943, by Alton H. Blackington, Yankee Magazine, April, 1965.